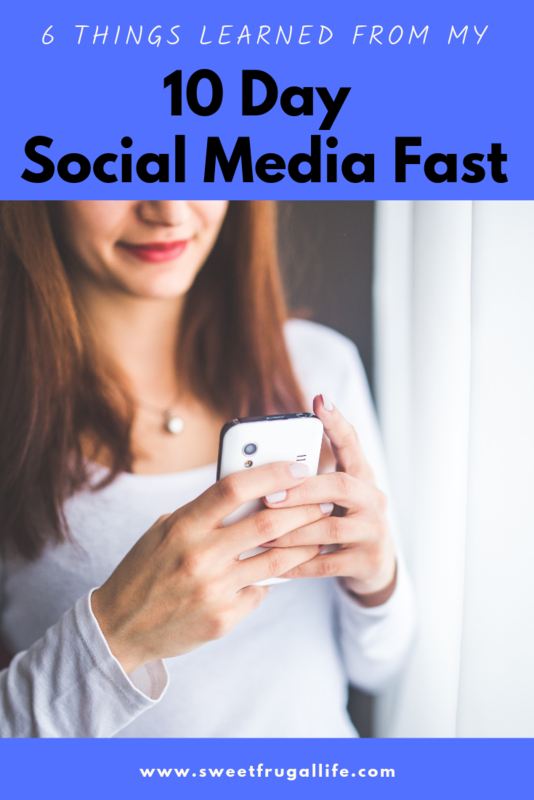 I just finished a 10 Day Social Media Fast. And it was FANTASTIC! After I got over my anxiety of just wanting to know what everybody was doing at all times (joking slightly here…. ), I fell in love with the new focus of my life. I was finally spending my time focusing on what was right in front of me…..rather than what was on my screen. The Social Media Challenge originally came from the president of my church, President Russel M. Nelson. He was speaking to all of the women of the Church of Jesus Christ and issued 4 challenges to us. One of those challenges was to take a break from social media for 10 days. I was really excited about this challenge when President Nelson first issued it. I’m honestly not a huge fan of social media, and sometimes wish for the days before it all came about (anyone old enough to remember AOL Instant Messenger????? or is that just me????). My original plan was to take a break from my personal instagram account, and keep using my business Sweet Frugal Life account. I have been working hard every day trying to grow that account, and I was worried if I took a break from it, I wasn’t sure if I would be able to get the momentum back. But then……I realized that my business account was probably the MOST important account for me to take a break from. I rarely spend time on my personal account, but my business account takes hours of my daily routine. I knew I needed to take a break from ALL social media in order to learn the lesson President Nelson wanted me to learn. This break was so good for me! I almost didn’t want it to end! But, it did….and I am using all of the lessons I learned to help keep me focused as I move forward with a new routine. As much as I do NOT want to admit it…..the social media addiction is real and strong. The first few days of my fast I found myself constantly reaching for my phone. I really struggled fighting the desire to open my instagram and facebook apps. I finally just deleted the apps from my phone, and the temptation decreased quickly. It took a few days to “detox”, but I finally got to the point where I didn’t think about social media as often. I couldn’t believe the amount of time I actually had once I quit checking social media regularly. I read a book, did a few crafts, and enjoyed some of my hobbies I haven’t even thought about for years! As a busy mom of 3, I often feel like I am running at full speed all day. It is not uncommon for me to announce I just don’t have any free time……well…without social media I actually had that TIME I had so desperately been missing. Throughout the 10 days I found myself having the thought, “I should take a picture of this for Instagram;” which was immediately followed by the thought, “No, I’m not using instagram right now so I don’t need to take a picture.” After this happening a few times I finally realized how ridiculous I was. I CAN and SHOULD take pictures of sweet memories….not to post on Instagram….but for ME. It didn’t take very long for me to realize that I had been missing out on a lot of family time. I try really hard to not be on social media around my family. But, I hadn’t been doing as good of a job as I should have. Once social media was gone from my life, I found my time and connections with my family growing. I was so worried about taking a break from my business instagram account would hurt the accounts, but guess what….they continued to grow without me. I have 90% of my social media posts scheduled weeks in advance. My accounts kept automatically posting for me….and my business kept growing. I didn’t HAVE to spend as much time on it as I originally thought I did. This was an important lesson for me to learn. I have decided to set some new rules for me and my business accounts. I will be spending less of my time working on them, and I can do this guilt free because I have seen it will still grow. Life goes on! The most important thing I learned from this fast, was that if we follow the Prophet, we will blessed. The Church of Jesus Christ believes that we have a prophet on the earth today. This prophet, President Nelson, is inspired in the things he counsels us to do. I know that I have received blessings, and will continue to do so….all because I put aside my selfish concerns and did what was asked of me. Have you ever taken a break from social media? How long of a break did you take….and what were some of the lessons you learned??? I have finished the ten day fast and I am in Mosiah for the reading part. Way to go! I’m still in 2 Nephi! You’re rocking it! Not having any thing to do with insta gram and very little do do with Facebook, I thought this request was odd. But of course I did not question it. I just did not realize it was a problem. We use Face book to communicate through out the ward for needs. I just spend so little time there. I guess that this is a real problem or it would not be addressed. I am so busy I have no time for social media. My blog is for me to help save money and keep my goals straight. I am glad that many saw the wisdom of this request. That’s great social media has never been a problem for you! I love how the challenge includes any media not uplifting, I also limited some of the tv shoes I watch! I love that! I’m so glad you had that time with your daughter. Sometimes we don’t realize how much time we are spending on Instagram until it’s taken away.